Sunflowers may look like the sun if you squint your eyes a bit, but they also do this weird thing where they turn to face the sun, hence the name. But how and why these plants move over the course of a day has stumped scientists for over a century. However, a new study published on Friday in Science by a team at UC Davis reveals some of the secrets behind the plant’s movement, and it comes down to circadian rhythm. Sunflowers start the day facing the sun in the east. Over the course of daylight, they turn to face the sun. At night, they turn back to the east, starting anew. So it’s clear that they’re following the sun for a specific purpose and according to the paper, it’s to provide a growth boost and to attract more insects for pollination. Researchers ran multiple tests on the flowers. First, they forcibly would stop plants from turning or would plant them in areas without direct sunlight and found that plants deprived of the sun would have less mass and less leaf area than those that could grow uninhibited. They also found, by placing ink dots on the stems and filming them, that the east side of the plant would grow faster when facing the sun. When it turned, the west side would grow. Stacey Harmer, a professor of plant biology at UC Davis and a senior author on the paper, stated in a press release that there appear to be two growth mechanisms at play: the first providing basic growth and the other controlled by a circadian clock and light. As one side of the stem grows faster than the other, it causes the flower to sway. 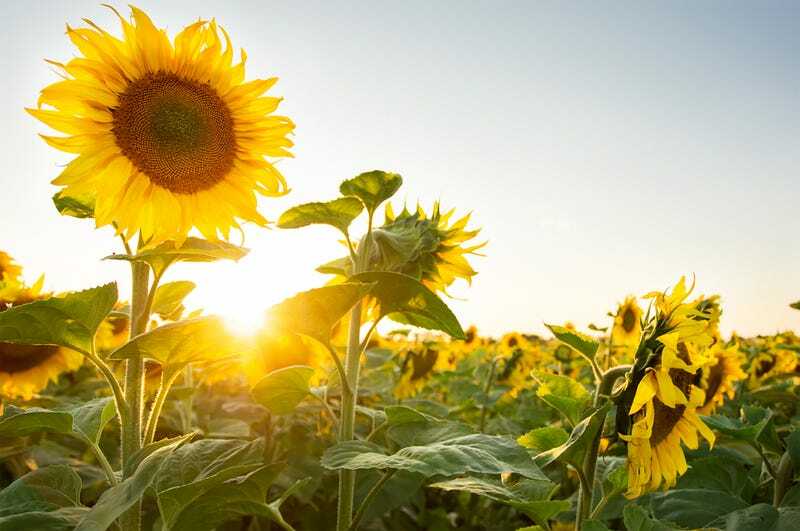 Researchers also found that sunflowers that were heated by the sun attracted more insects. East-facing plants heated up quicker in the morning, therefore attracting bees for pollination. The circadian rhythm mirrors that seen in a number of animals, including humans. Even when exposed to artificial light, the sunflowers would track that movement in a consistent cycle. According to researchers, is the first evidence of its kind that shows an effect it can have on growth. “It’s the first example of a plant’s clock modulating growth in a natural environment, and having real repercussions for the plant,” Harmer said. Not sure if it’ll work the same way on humans, but I guess it’s worth a shot.